There is just something almost magical about classic American cars that is impossible to explain. Maybe it's the memories they invoke of our more youthful days. Maybe it's the yearning for simpler times. Whatever it is, that time is available once again with the 55 Classic American Pedal Car. Presenting the beautiful 1950's Murray Comet Pedal Car. One of our best sellers, particularly because of it`s quality build, specification and most attractive price. Features include: chrome hood, chrome windshield, chrome grill ornaments, chrome headlights, chrome steering wheel, chrome portholes and hubcaps. The chrome finish is metal as opposed to plastic. Flame Decals. Sealed bearing pedal mechanism with 5 position pedal adjustments to suit most children 2 to 5/6 yrs of age. Also comes with black padded seat. All metal construction with solid Duralast rubber tyres. Delivered fully assembled to your door. The classic chevy 55 Roadsters are a must for all classic pedal car enthusiasts. These all metal pedal cars are inspired by an American icon - the original 50s Chevrolet. 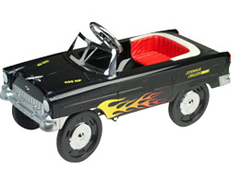 This particular model is black with a hotrod flame effect and has a red padded seat and hotrod black wheels. This pedal car would make any kids dream of owning a classic pedal car come true. 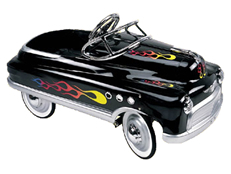 Reminiscent of a time when American know-how and engineering ruled the auto world, the Chevy 55 classic pedal car makes for an ideal heirloom gift Overall length: 39.5 in. Overall width: 16.75 in. Overall height: 13 in. to the top edge of body. 20 in. to the top ...of steering wheel. Wheel diameter: 9 in. Wheelbase: 23 in. Shipping weight: 35 lbs. Finish: baked enamel, lead free paint. Brum brum off we go! Cards accepted: Delta, Mastercard, Visa, Mastercard Eurocard, Solo, Switch.